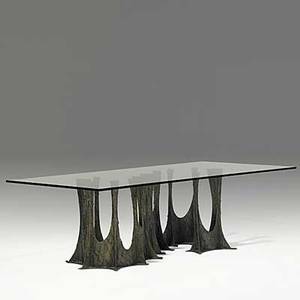 Paul evans sculpted bronze dining table, with plate glass top resting on a serpentine stalagmite base. 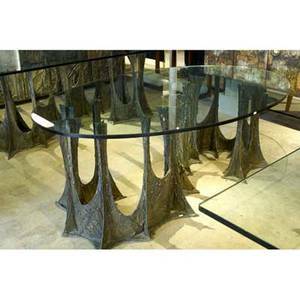 28 3/4" x 72" x 44"
Archived auctions similar to Paul evans sculpted bronze dining table, with plate glass top resting on a serpentine stalagmite base. 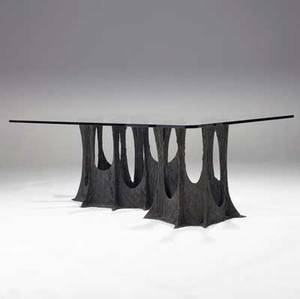 28 3/4" x 72" x 44"
Paul evans sculpted bronze dining table with plate glass top resting on a serpentine stalagmite base, 1972. signed pe 72. 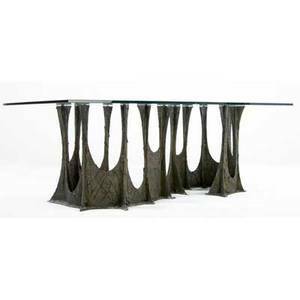 29" x 82" x 40"
Paul evans sculpted bronze dining table with plate glass top, its base consisting of horizontal and vertical flat planes, 1971. signed pe 71. 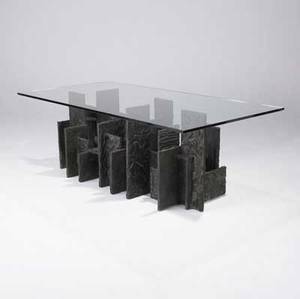 29 1/2" x 96" x 48"
Paul evans sculpted bronze dining table with clip-corner rectangular plate glass top on serpentine base, 1973. signed pe 73. 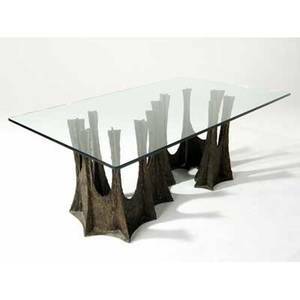 28 3/4" x 82 3/4" x 47"
Paul evans; sculpted bronze disc bar with interior cabinet, drawer and locking door, 1969; signed pe 69 72" x 72" x 19"
Paul evans sculpted bronze dining table with an elliptical plate glass top on a serpentine stalagmite base, 1972. signed pe 72. 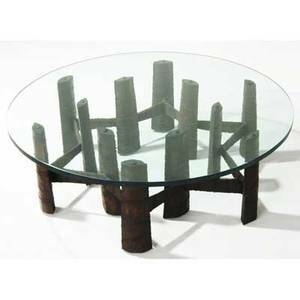 26 3/4" x 72" x 37 3/4"
Paul evans sculpted bronze coffee tale with circular glass top. 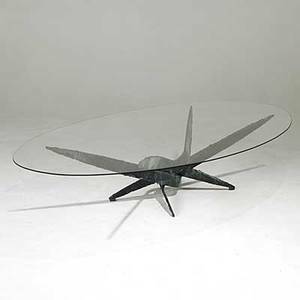 14 1/2" x 42"
Paul evans; directional; cityscape dining table, usa, 1970s; complete with three leaves; chromed steel; signed; 29 1/2" x 50" x 44", each leaf: 15"
Style of silas seandel; bronze cocktail table with plate glass top; unmarked; 15 1/2" x 77 3/4" x 46 3/4"
Paul evans; sculpted bronze and glass dining table on serpentine base, 1973; signed pe 73. 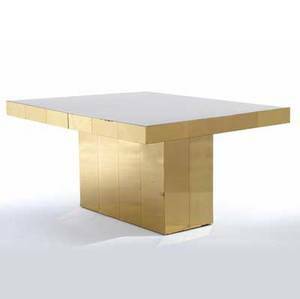 28 ;3/4" x 96" x 48"
Paul evans cityscape extension dining table with an ivory plexiglass top on brass base. 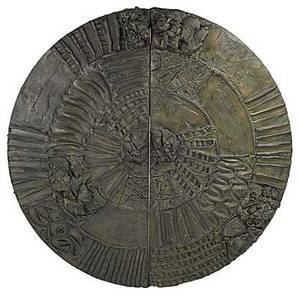 complete with one 15" leaf. 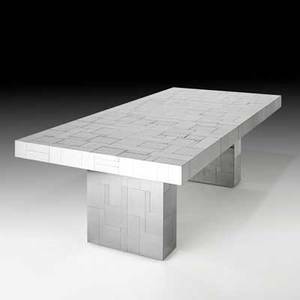 closed: 29" x 60" x 44"